"In what year will the UK have a Muslim majority? And does it really matter anyway? I will probably have passed away by then, so why should I care? We should care, for the sake of the younger generation ... [who] will be living part of their life under Islamic rule in the UK if current demographic trends continue. This is the massive elephant in the room, which nearly every politician is studiously ignoring. We know that trying to discuss Islam in public will get you arrested. We are probably already past the 8% point, or within a few years of it. From now on it becomes increasingly difficult to reverse the situation. We only have about 13 years remaining to avert this catastrophe, or else condemn our children or grandchildren to living as Dhimmis under Sharia Law. The time to wake up is right now" [source]. "European leaders accepted the transformation of parts of their countries into enemy territories. They see that a demographic disaster is taking place. 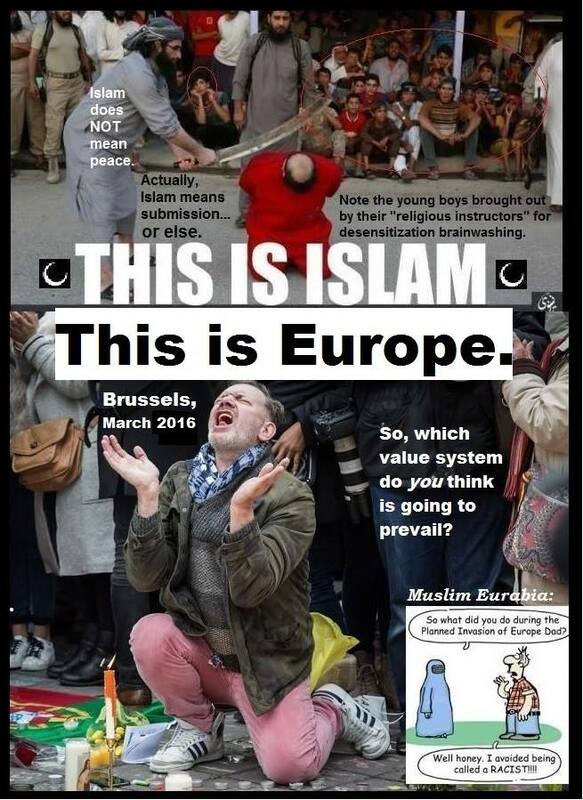 They know that in two or three decades, Europe will be ruled by Islam"
"What the Left call 'diversity' cannot be applied to an ideology that forbids diversity as its central tenet and gives non-Muslims only three options: be conquered, convert, or die. ... sharia law will be applied to everyone unfortunate enough to fall under Islamic rule, even in England" [pp.18,19]. The terrorist Jihad attacks listed below (mostly UK) are just a very tiny proportion of the number of terror/jihad attacks carried out by The Religion of Peace since the start of the 21st Century. Please see here for a much more comprehensive list of the number of modern-day Islamic attacks on the Dar-al-Harb. "This is part of the list of killings in the name of Islam ... Most of these incidents are terror attacks. A handful are honor killings or Sharia executions." "This is a list of targeted acts of terrorism on Christian civilians and church workers by religious Muslims since September 11th, 2001. These attacks have nothing to do with war, combat or insurgency. The victims are innocent Christians who were specifically targeted and abused solely on account of their faith by those who claim their own religion as a motive ... this is [not] a complete account of Islamic terror attacks on Christians since much of the violence goes unreported." "For the first century of its existence Islam was absolutely soaked in blood. The killing only slowed down as the Islamic empire finally ran into boundaries in the 8th century, after about a century of expansionist, imperialist, unprovoked, Islamic aggression. Even after the initial expansion slowed, the killings did not end. Slaughter (jihad) and oppression (sharia) are part of the core doctrines of Islam ... For many years now, Islam has been the most violent religion in the world." "To prohibit the Islamic legal system derived from the religious precepts of Islam, particularly the Quran and the Hadith, from being practiced or implemented within the UK, to protect and maintain the supremacy of the UK's current constitution along with its legal and judicial system. ... Sharia law opposes democracy and supports actions that either breach, or are contrary to, human rights, civil liberties, and current statute and common laws of the UK." "So what did you do during the Planned Invasion of Europe, Dad?" "Well honey, I avoided being called a RACIST"